Two angels, 11 of the 12 disciples: Simon/Peter, Andrew, James (son of Zebedee), John (son of Zebedee), Bartholomew/Nathaniel, James/Cleopas (son of Alphaeus), Matthew/Levi, Philip, Simon the zealot, Thaddeus/Judas (son of James), Thomas/Didymus. NOTE: Judas Iscariot had hanged himself by this time. They worshiped him and then returned to Jerusalem filled with great joy. Although Bethany is not far from the Mount of Olives! Just a thought: What would you have done, if you were one of he disciples & Jesus was ascending into heaven before you… would you wave goodbye!? Originally I drew their upraised hands in worship, but adding the “whizz lines” I realised that they look like they are waving goodbye! But then again, perhaps some of them might well have done that very thing… and maybe we would have too?! 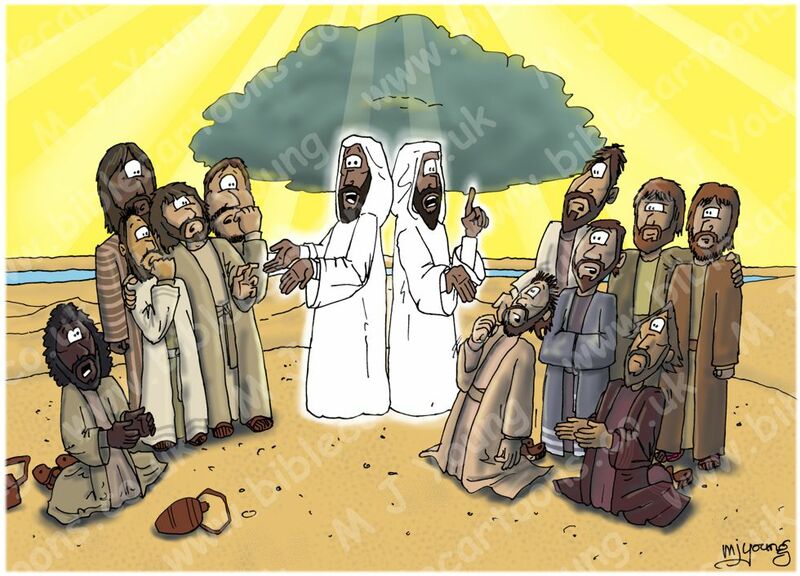 Just another thought… The scripture says that Jesus’ disciples were with him when He ascended. I have drawn the 12 disciples, but I could have included the various women who supported Jesus’ ministry as well, there could well have been other, unspecified disciples present as well.